People who are allergic to eggs or vegans may be seeking an eggless flu vaccine. While biotech firms are working on eggless vaccines, they are not available to the general public. Many firms have, in fact, abandoned exploration into eggless flu vaccines because the profit margins are slim. Before talking about eggless flu vaccines, it's important to understand how vaccines work and how they're made. Vaccines are preparations given through injection or nasal spray with a dead or weakened version of a virus. By exposing the body's immune system to the virus, the immune system learns to target the invading virus and builds its immunity to the virus, thus preventing full-blown sickness when exposed to the 'real thing.' You can become immune to a virus through natural exposure or vaccination. Remember that natural immunity to a virus can be acquired without coming down with the full-blown sickness. You're exposed to viruses, bacteria and other invaders throughout your life, yet you probably don't come down with a cold or flu very often. That's because your immune system is on guard 24 hours a day, 7 days a week. In most cases, it can successfully identify and combat an invading microbe before it gets into cells and causes disease. According to CNN's website and Discovery Health, all vaccines are made using chicken eggs. Day-old chicken eggs are injected with the virus solution. The influenza virus is grown in these eggs before treated to inactivate the virus. Then, the fluid from inside the egg is extracted and used to create the influenza vaccines. For people with egg allergies, even the tiniest particles of egg protein that remain in the vaccine can cause a reaction. People with severe egg allergies are advised to avoid vaccines. Nasal sprays actually contain even more of the egg proteins than vaccinations and should also be avoided by people with egg allergies. With the growing awareness and interest in animal rights, as well as many people allergic to eggs, why are vaccines still developed in this way? If the chicken egg method seems slow and antiquated to you, it's equally frustrating to many of the pharmaceutical companies that develop vaccines. There's little profit margin in developing vaccines, and most companies do so as a public service. Some biotech companies have been exploring alternative methods to growing influenza virus cultures by using other growing mediums. Unfortunately, these haven't achieved the desired results, and most have abandoned research and development into an eggless flu vaccine. So for those who were hoping that there's a company, doctor or hospital offering an eggless vaccine, sorry to disappoint you. But there are many, many natural ways you can avoid contracting influenza in the first place. If you're someone who won't take the flu vaccines for whatever reason, you can still take charge of your health. Keeping healthy and fit during flu season is the best defense against contracting H1N1 or any influenza virus. Wash hands frequently with warm water and soap. Avoid touching the nose, eyes or mouth. This is how many viruses enter the body. Eat a diet rich in natural sources of vitamins, minerals an antioxidants. Vegetarians and vegans are one step ahead by eating a healthy, plant-based diet. Get plenty of rest, fresh air and exercise. Use immune system boosting herbs, such as Echinacea and goldenseal and garlic, or try an herbal preparation at first sign of the sniffles, such as Gaia's Herbal Defense supplement. If you're at high risk for complications of the flu and cannot get a vaccine to prevent it, see your doctor at the first sign of flu symptoms. Although H1N1 is sometimes resistant to anti-flu medication your doctor may recommend that you take antiviral medication to reduce the severity of the flu. Only your doctor can advise you whether or not this is the best course of action, so consult a physician with questions. The flu can be a serious ailment for the elderly, the young, and people with ongoing health issues. Unfortunately, if you fall into that category and you're vegan or allergic to eggs, there's no completely safe vaccine yet. Talk to your doctor, because the biotech world is constantly changing, and hopefully he or she will have the latest information. He or she may also have other suggestions to help you avoid or combat the flu and stay healthy. 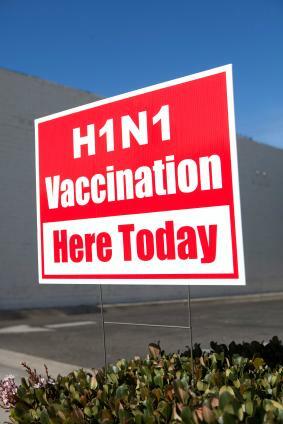 Recent reports indicate an H1N1 eggless vaccines being tested in Europe, but it's not in America yet.